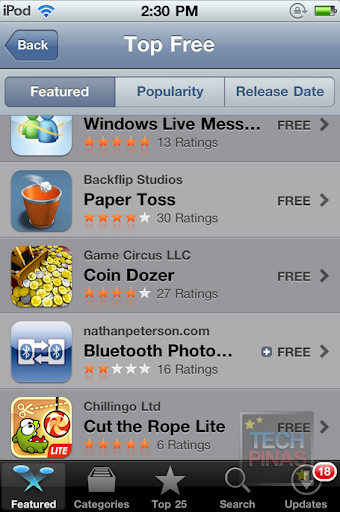 Apple has published its list of the top free applications from the App Store for iPhone and iPod Touch in 2010. Tom is your pet cat that responds to your touch and repeats everything you say with a funny voice. Windows Live Messenger for iPhone and iPod Touch is the best way to connect with the people that matter most and keep up with the things they are doing across the web. Have you ever been bored at work, crumpled up a piece of paper and counted how many times you can shoot it in a small trash can? Have you ever brought in electric fans to make the shot even harder? Backflip Studios is happy to announce that they have brought this amazing and hilarious experience to the iPhone and iPod Touch! Transfer photos and/or contacts between two iPhones and/or iPhone Touches over Bluetooth easily! A mysterious package has arrived, and the creature inside has only one request: CANDY! Try out 18 full levels and combine physics and ingenuity to feed him. I have all these on my iPod Touch 4G*. 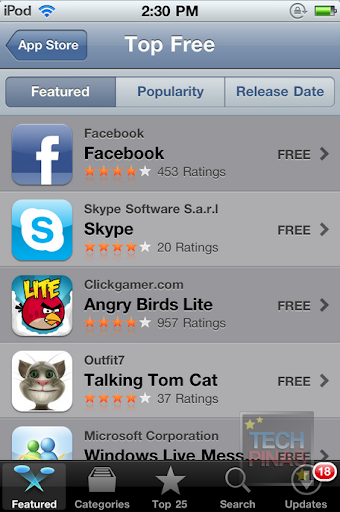 My favorites are Facebook, Angry Birds Lite and Cut The Rope Lite. *All new generation Apple iPod products that we review were provided and warrantied by Power Mac Center. TechPinas deeply believes in the quality of products and after-sales service of Power Mac Center. I think here mentioned all the apps are awesome and evergreen. In these app Talking Tom Cat app is very funniest app and i really like it. Grow optimal integration patterns to promote your company’s brands among various customers types with flexible http://appyresto.com app maker! Get apps for contractors, law firms, public schools and worship.